We have now been using the Easywalker Duo for one month and it has taken on the nickname 'monster truck'. 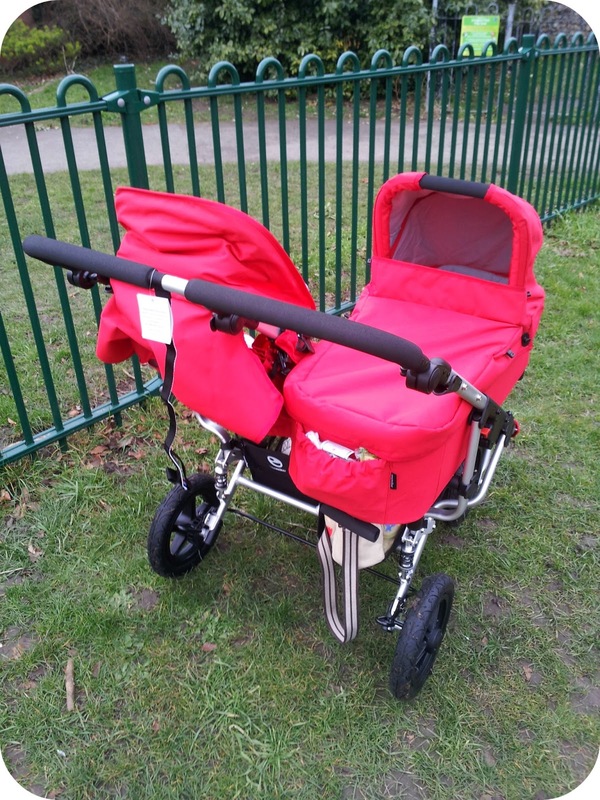 The Duo is a well built and sturdy buggy and the air filled tires give the pushchair height. It may not fit through my front door (no side by side doubles do) but it is perfect for our active lifestyle as I feel like the monster truck can cope with anything. I chose the duo is red as I am not a fan of black buggies and the colour is gorgeous and really stands out. The pushchair has the option of a forward facing seat unit or carrycot on both sides meaning it is suitable from newborn onwards. 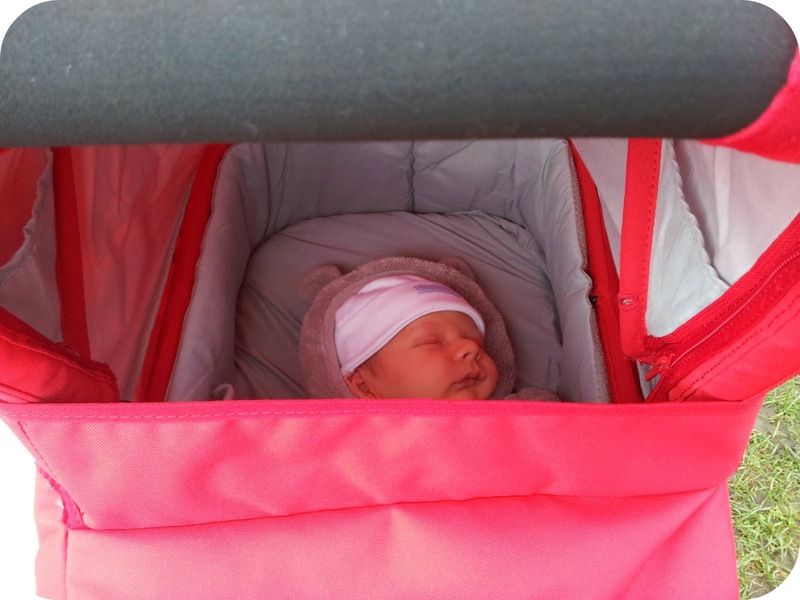 The carrycot is sturdy, spacious and comes with a mosquito net and a mattress cover which is very well thought out. It is easy to put on and takeoff the pushchair, so I get Archie all ready in there before we go out and simply clip it in when the buggy is set up. The seat unit has several recline positions and is lovely and spacious even with my chunky nineteen month old. This is very important for me as we are out a lot and I see Dylan needing a buggy for quite some time so I require one that accommodates him comfortably and that he can nap in. The seats are only forward facing, but they have a large panel in the top that can be pulled back to reveal a clear plastic peep hole and Dylan and I love playing peekaboo through it. It can be clipped back too if you want to keep an eye on them. The hood is a good size, and has an extra sun shield that can be pulled down at the front as well (which Dylan loves to play with) . Although it doesn't have clips to hold it in place at the side, I almost got blown over by the wind today, and the hoods held out fine so it really isn't necessary! 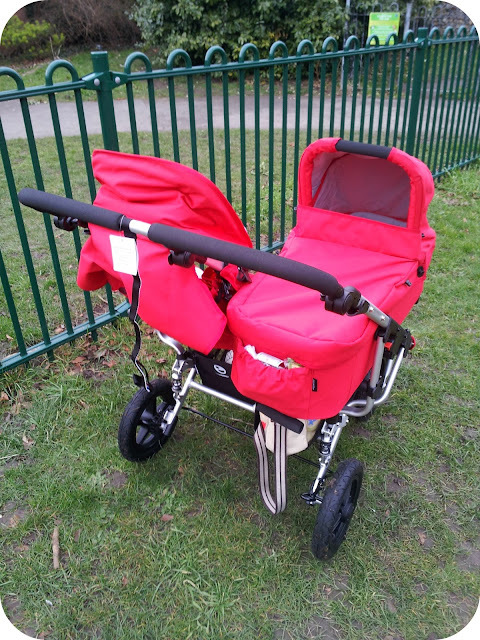 The buggy is easy to fold without any tricky foot movements, there is simply a red button to push forward at the side and then two clips to push as the buggy folds in half. Even folded the pushchair is bulky but the seat units stay attached ( carrycots must be removed ) so it is not fiddly The Duo is a heavy pushchair to carry, but you really can't tell when you push it and it is very easy to get up curbs and steer even with a heavy toddler weighing it down! I was suprised at how smooth and light it felt to push with two children and a rather large nappy bag on board! I managed to hold one child and push with the other hand without any problems which is rather handy as there is always one that wants a cuddle! I did have a few problems with the front wheels at the beginning as they kept locking but it didn't take long to work it out. It is much harder to push when the front wheels don't swivel, so make sure you have them in right! There are two baskets - both nice and large and they have two sips at the front to extend them. I have the pink lining twins bag and it comfortable fits under one side with the zips down and was nice and easy to get in and out. The rain cover is quite rigid and does take up a lot of space underneath but is very sturdy and spacious when in use and we have been using it quite a lot with the current weather! 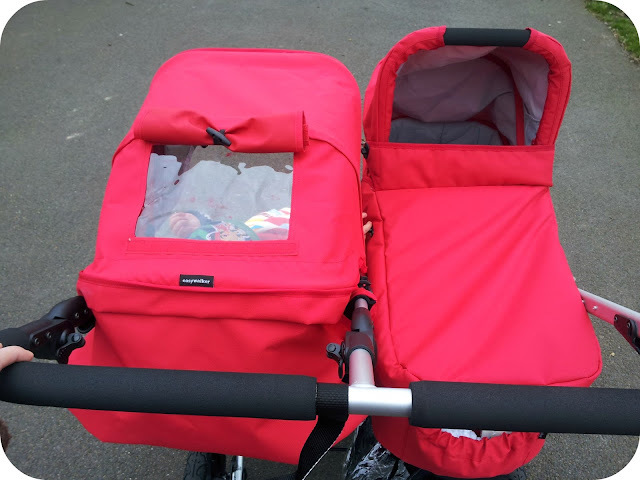 There is a different raincover for when using two seats or one seat and one carrycot/carseat. There is also a lovely handy pocket on the carrycot which I have been keeping a spare muslin in (you never know when you are going to need one!) and this is one of my favourite features of the pushchair. Overall I am very impressed with the Easywalker Duo. It did take me a few trips to get used to it's size and steer but I feel like my boys are safe and secure in there and they seem incredibly comfortable! In an ideal world I would be able to have the boys facing me, but to have a pushchair that does this you would lose it's ability to fold in one piece. 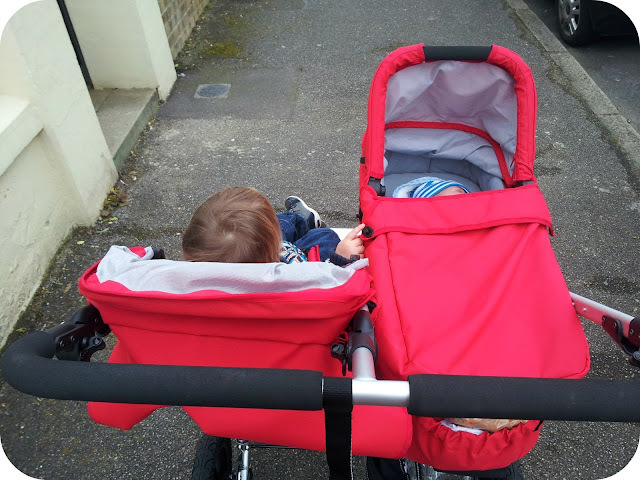 I think the Easywalker Duo is worth the money as it feels like a pushchair built to last and the tyres make it suitable for all terrains. Disclaimer: I was sent the Easywalker Duo for the purpose of this review but all thoughts, opinions and photos are completely my own. Evening, I can spot your baby in the buggy. How gorgeous, congratulations!! !